Metamorphosis, the Journal of the Lepidopterists’ Society of Africa (LepSoc Africa), is a peer-reviewed scientific journal which publishes articles on any aspect of the study of African Lepidoptera. 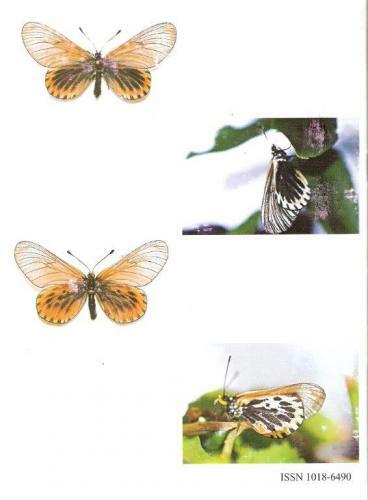 This supports LepSoc's objective of furthering the knowledge of the diversity, taxonomy, habitats, distribution and life cycles of African Lepidoptera (butterflies and moths). This knowledge is then applied towards their conservation, which is the ultimate aim of the society. Up until the end of 2011, Metamorphosis covered accounts of interesting field trips as well as contributions of a more scientific nature. There were four issues per annum in printed format, with unusually large contributions accommodated as occasional supplements. From 2012 Metamorphosis became LepSoc Africa's scientific journal, published online (ISSN 2307-5031), as well as a printed journal (ISSN 1018-6490). Online publishing is cheaper and allows quicker processing of manuscripts, better visibility and availability to the scientific world, and sets no limits on the amount of colour images or the size of articles. Published articles are immediately available as PDFs for download and e-mailing to colleagues, in a format suitable for standard printers. Each year a printed version is produced, containing all the articles published during the previous calendar year. To encourage universities to place more emphasis on Lepidoptera research (particularly for conservation purposes), the LepSoc Africa council resolved in 2015 to make Metamorphosis an "Open Access" journal. The reasoning behind this was to raise LepSoc Africa's international profile and prestige, and to increase the volume and quality of research being done in this field. Open Access is also an advantage which helps Metamorphosis to gain accreditation with the South African universities. This would enable researchers from these universities to qualify for subsidies for research articles published in Metamorphosis. To access Metamorphosis, click the ‘Publications’ tab on the header bar, and select ‘Metamorphosis’. Scroll down to "Click here to view the publication tree of all our Metamorphosis articles” When the tree displays click on the [+] icon for a drop down menu. Select the year of the issue you want, click on [+} then on the Volume number. This will display a list of all the articles for that volume. When you have found the article you are looking for click the red PDF button to download the article. Metamorphosis is sponsored by Saftronics and Scott Bader.